The Hometown Newspaper forgets its own. 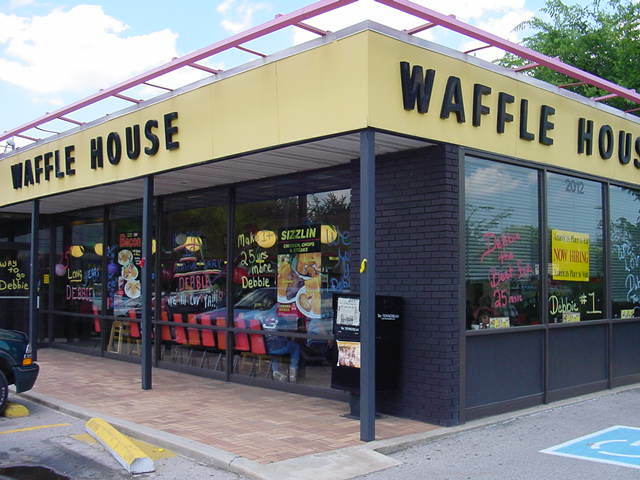 This is a story about a local lady that has been a server at the original Waffle House in Murfreesboro Tennessee for over 25 Years. 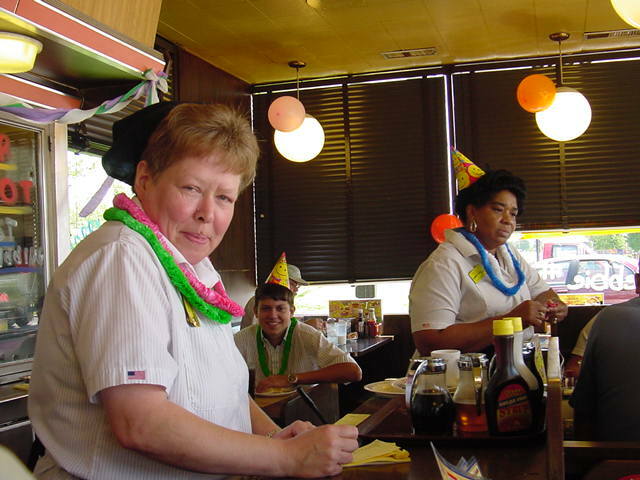 Debbie Keltner celebrated her 25 Anniversary with the Waffle House on Hwy. 231 South on July 2003. 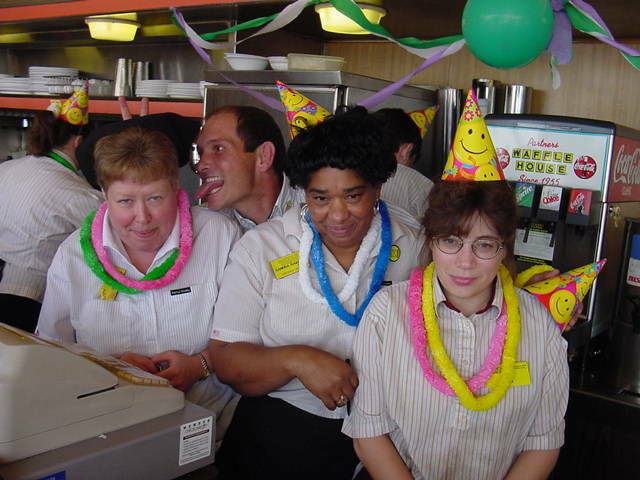 The Upper Management of the company thought it appropriate to celebrate her long term employment. 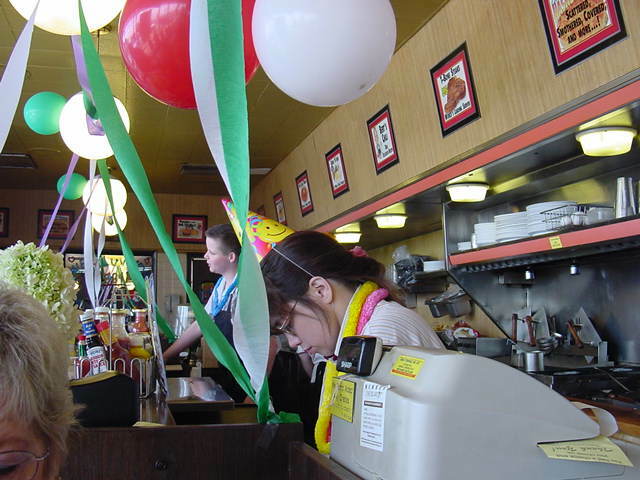 They allowed the fellow employees to paint the windows decorate get out the ole horns and party hats. 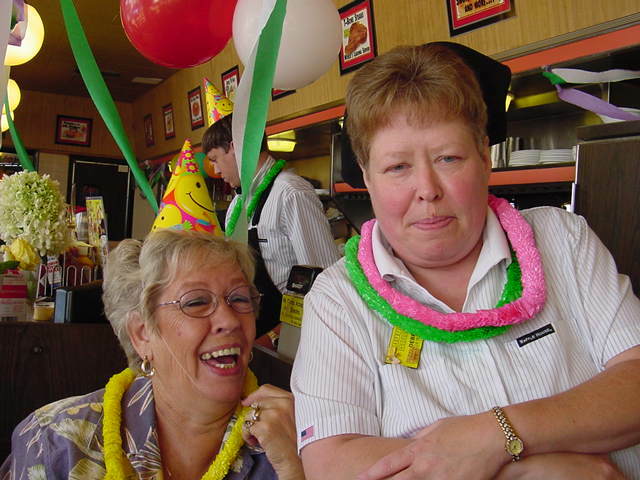 The celebration was not just for Debbie it was for the customers, local and travelers. 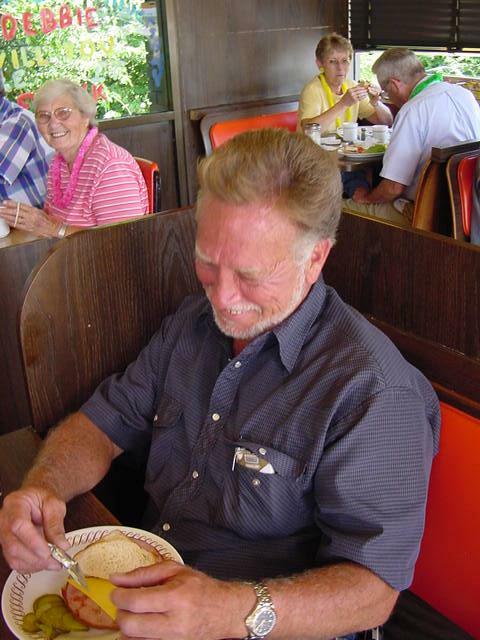 Every day in Murfreesboro like many restaurants there are locals that frequent a certain place and fellowship and lie and gossip and love and keep the Murfreesboro fires burning. 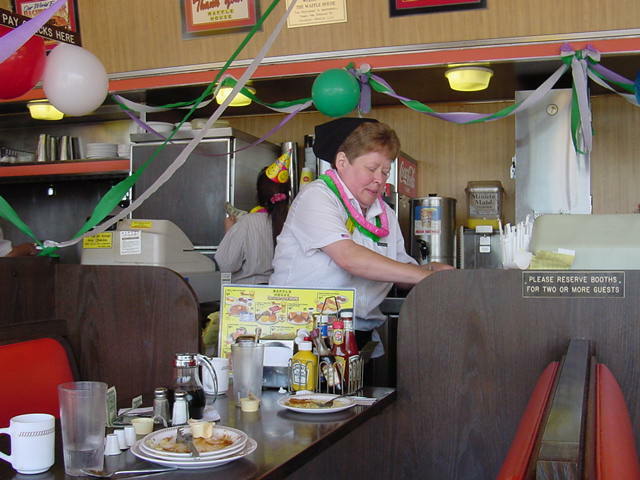 This particular day at the original Waffle House there were many that came by specifically to congratulate Debbie for her long time friendship and service to the residents and visitors here in Murfreesboro. Just off exit 81a on Interstate 24. 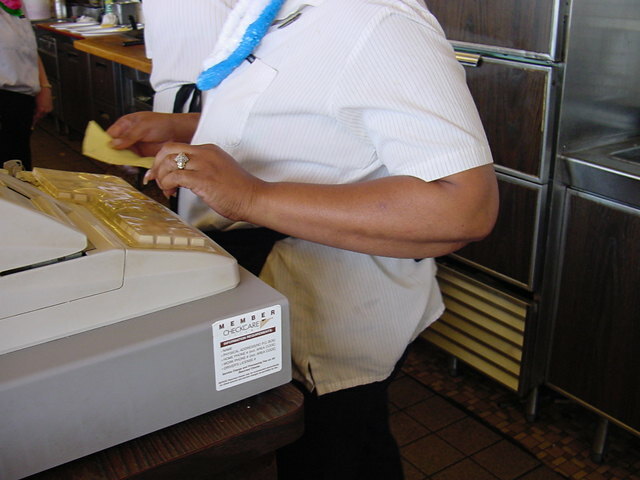 For 25 years Debbie has been here greeting visitors that are tired and worn from their travels, with a strong hot cup of coffee and a smile. A smile no matter what may be going on in her own life. 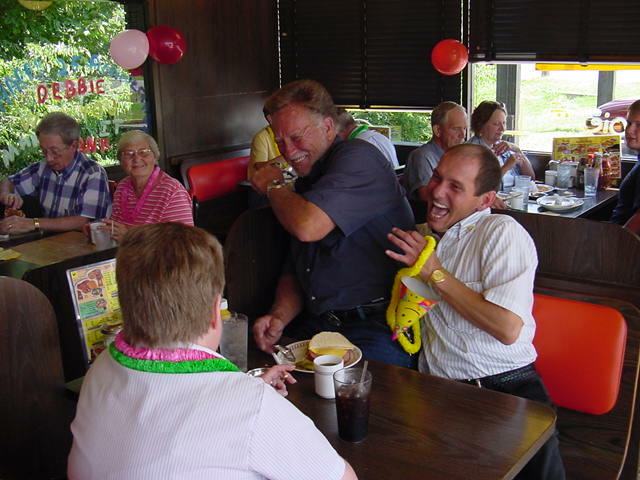 Showing the well known Southern Hospitality that the South is noted for. What a job/career. That's only a part of this great story. 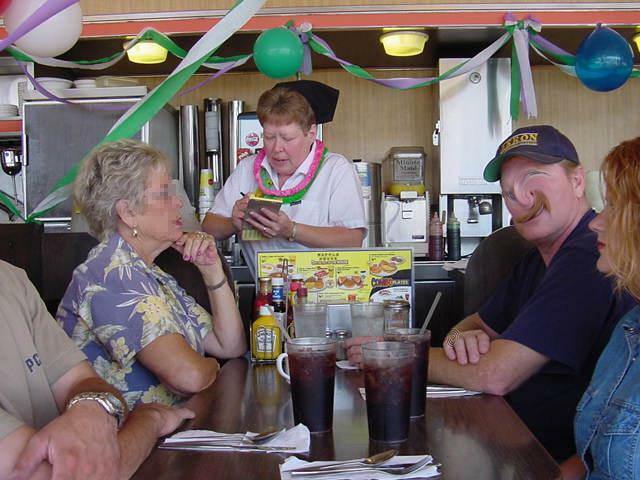 Debbie has locals that have been regular customers for all those years. 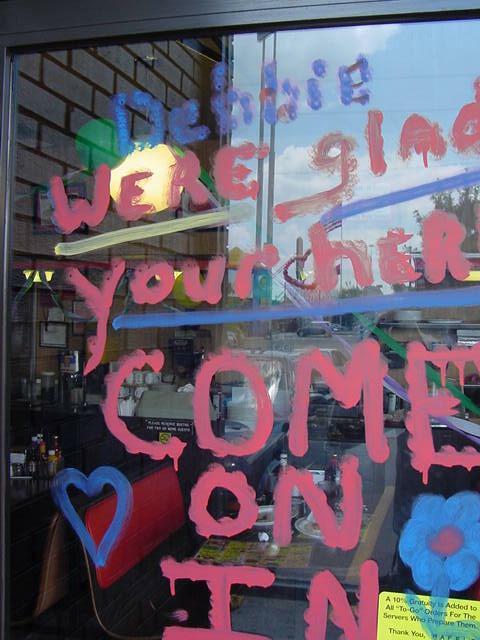 From the top to the bottom Debbie has had the opportunity to serve and get to know the many personalities in the Murfreesboro and surrounding areas. Along with this humble servers career goes many things. The great joys of others achievements and goals met in their lives and the tragedies and looses of friends and relatives. These servers are more than some lady bringing your breakfast or dinner. They always seem to have a shoulder to lean on in the happy and sad times. The reason for this story is a big thanks to the Daily News Journal our Local Hometown Newspaper. 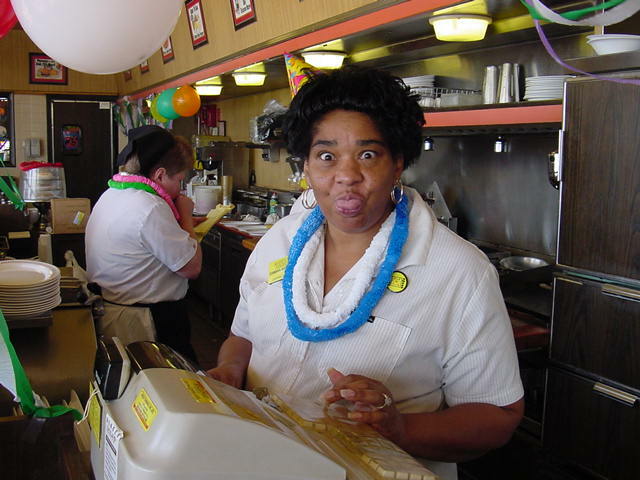 There were at least 3 calls made to the DNJ announcing the celebration of Debbie's 25 years of service to this community and the response was a little shocking to the callers. I mad one of these calls myself. To my amazement this didn't seem to be newsworthy. The non caring cool voice on the other end of the phone stated that he would Try to get a photographer out. 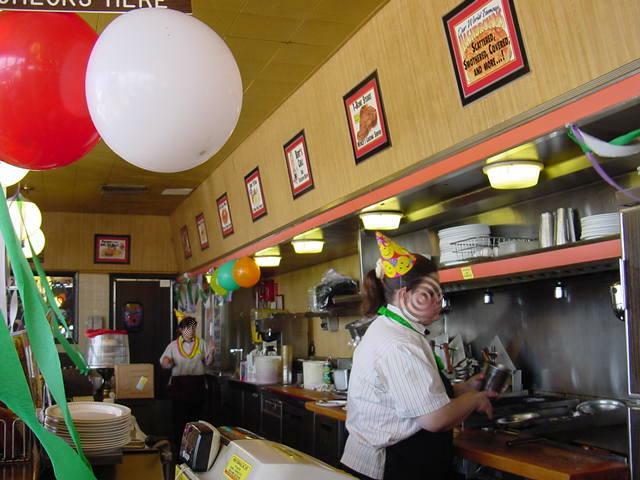 As I hung the phone up already knowing that two others had called in the last couple days I was discouraged but still hopeful that they would honor the celebration with just a simple congratulations and possibly a photo of Debbie and the decorated Waffle House. This may sound trivial to some of you good people. There was a short letter written to the editor of the Daily News Journal in the days to come. 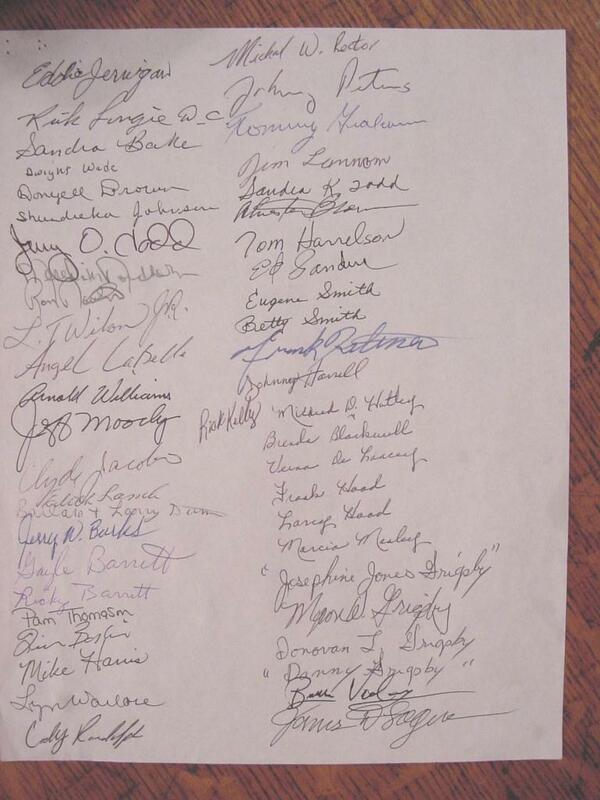 The letter bounced from one booth to the other for the next few days and was signed by 120 or more of the locals that felt the same way as the writer of the letter. 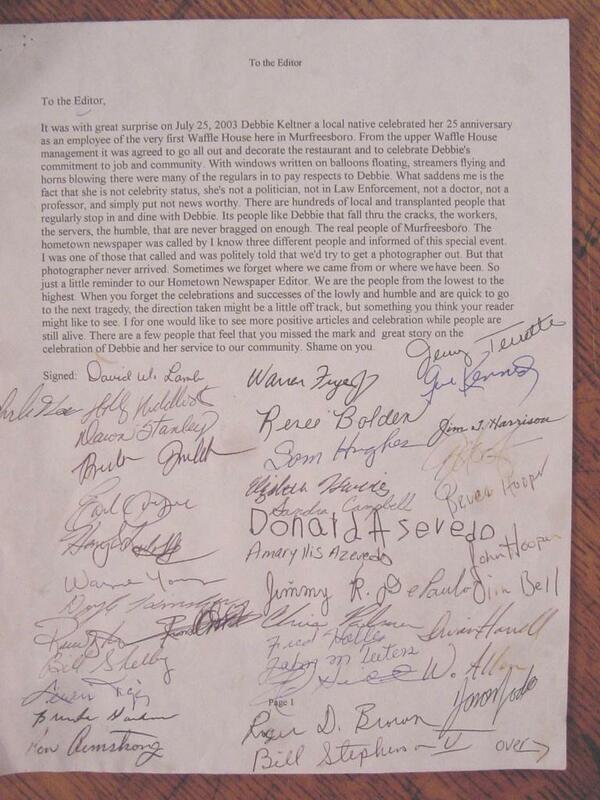 Below you will find a copy of the letter and the many signatures of the folks that took the time to read this letter and focus their attention to Debbie's celebration. After taking the time to read and digest the letter they put their endorsement on the paper to be sent to the Daily News Journal Editor. These are not strangers to Murfreesboro they are the average law abiding tax paying local citizens that mostly were born and raised here in Murfreesboro. 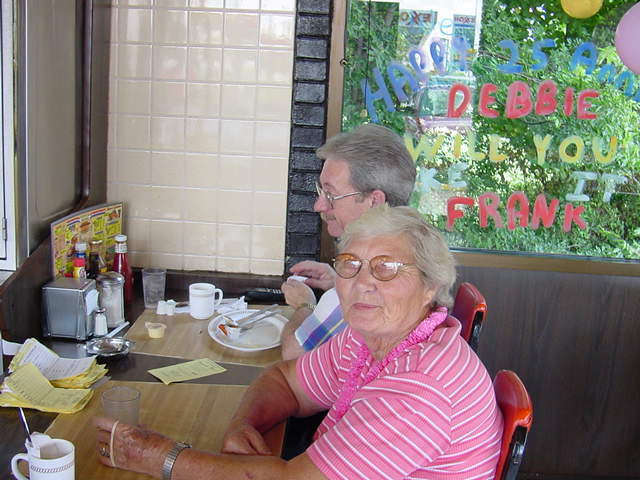 Like Debbie they have spent their lives here and worked together and alone to better the environment around us and to make the Boro the great community that it is. A copy of this letter was sent to the editor of the Local Hometown Newspaper Editor and plenty of time for a response was given. There was no response at all. 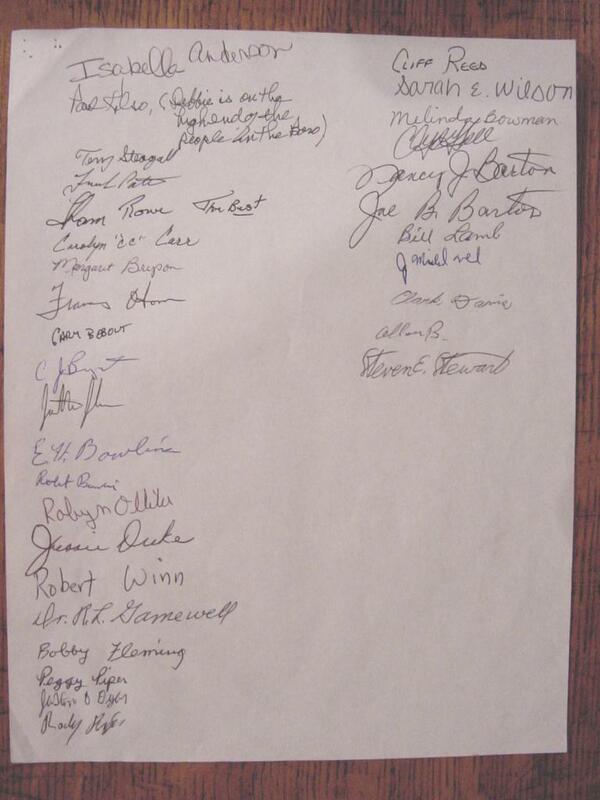 No call to Debbie or the writer of the letter or the many signers to my knowledge. I wonder why the Editor didn't respond? I personally think the DNJ missed the mark here. 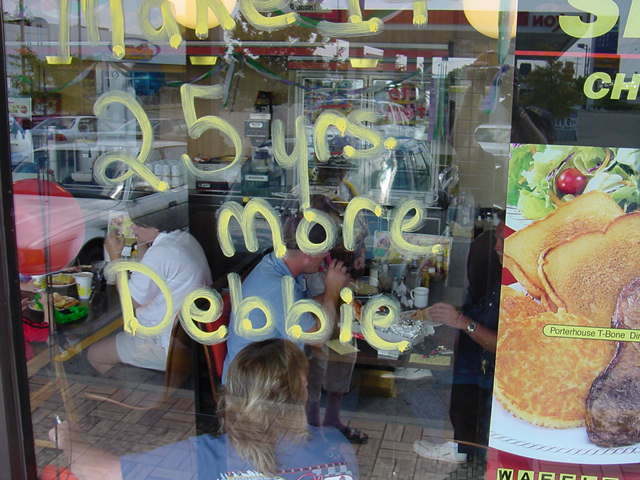 Id like to say Thank You Debbie for the many times you have been there for this old local. The smiles the coffee the tears. Putting up with Sandra for all those years. You guys are the Greatest and what makes Murfreesboro what it is today. And to all the others out there that work so diligently in our day to day live here. It takes us all, not just the politicians and lawyers and upper class folks that often make the pages of the DNJ. 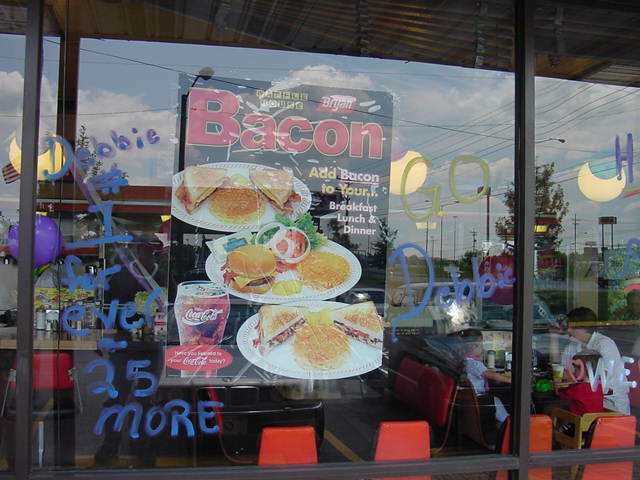 Please enjoy the pictures below of Debbie and the success of the Waffle House here in Murfreesboro Tennessee. For All The World To See. 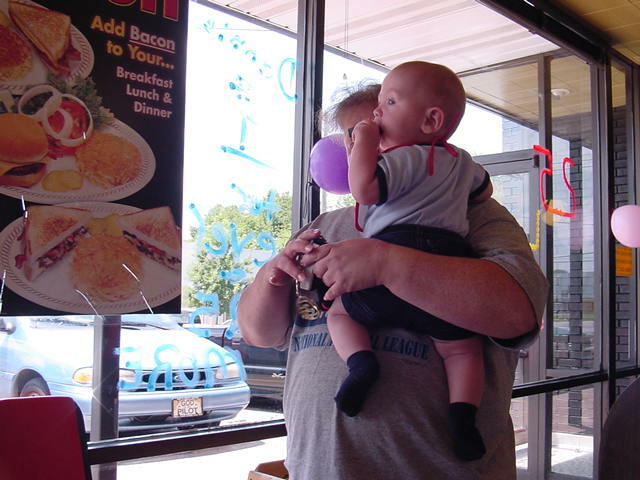 Click on pictures below to see a larger view. 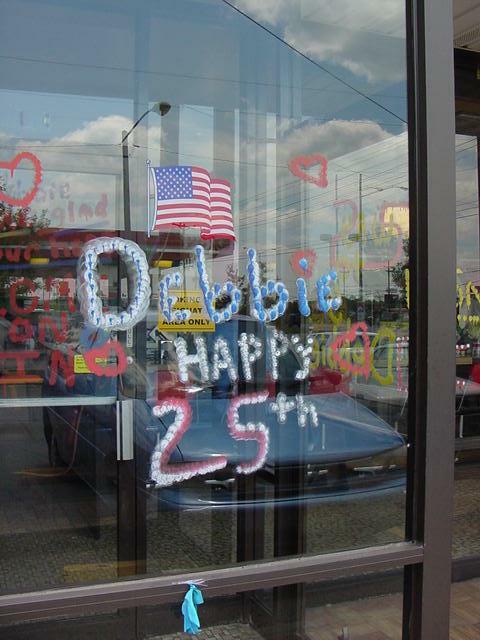 It was with great surprise on July 25, 2003 Debbie Keltner a local native celebrated her 25 th. 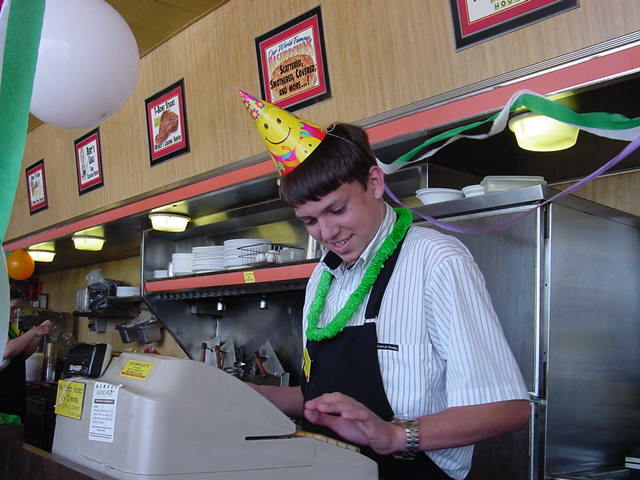 anniversary as an employee of the very first Waffle House here in Murfreesboro. 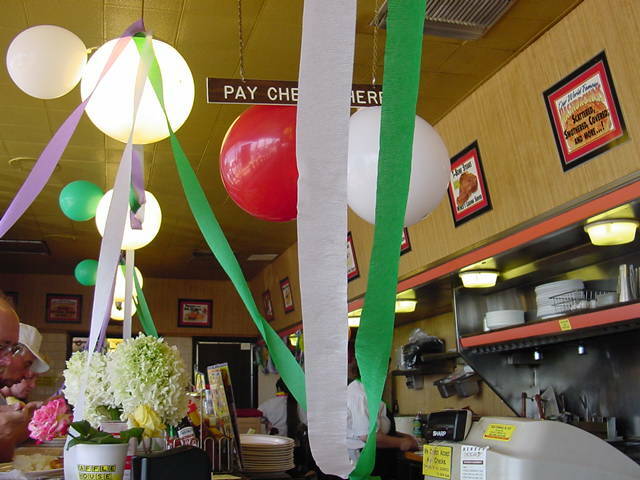 From the upper Waffle House management it was agreed to go all out and decorate the restaurant and to celebrate Debbie's commitment to job and community. 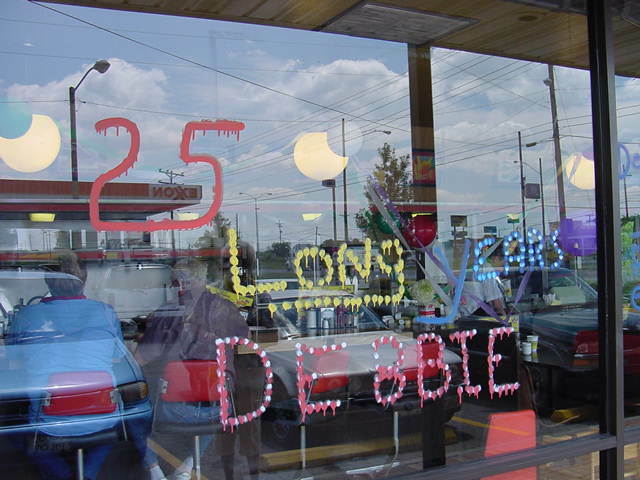 With windows written on, balloons floating, streamers flying and horns blowing there were many of the regulars in to pay respects to Debbie. What saddens me is the fact that she is not celebrity status, she's not a politician, not in Law Enforcement, not a doctor, not a professor, and simply put, not news worthy. 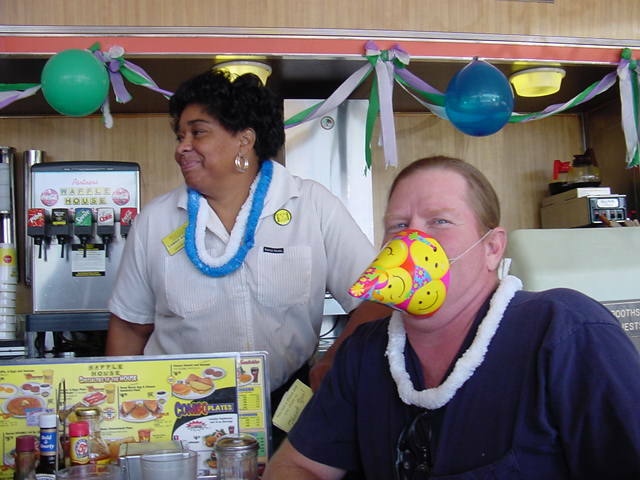 There are hundreds of local and transplanted people that regularly stop in and dine with Debbie. 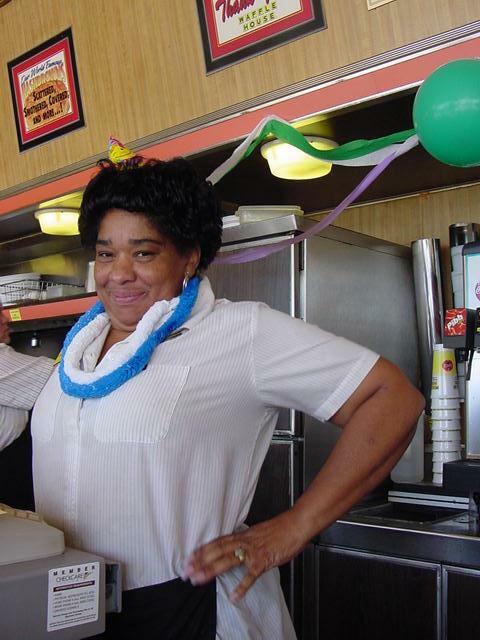 It's people like Debbie that fall thru the cracks, the workers, the servers, the humble, that are never bragged on enough. The real people of Murfreesboro. The hometown newspaper was called by I know three different people and informed of this special event. I was one of those that called and was politely told that we'd try to get a photographer out. But that photographer never arrived. Sometimes we forget where we came from or where we have been. So just a little reminder to our Hometown Newspaper Editor. We are the people from the lowest to the highest. When you forget the celebrations and successes of the lowly and humble and are quick to go to the next tragedy, the direction taken might be a little off track, but something you think your reader might like to see. I for one would like to see more positive articles and celebration while people are still alive. There are a few people that feel that you missed the mark and a great story on the celebration of Debbie and her service to our community. Shame on you. Signed: This letter was sent to the editor of the Daily News Journal along with 120 signatures of people that frequent Debbie. The was never any acknowledgement from the DNJ at all. We'd like to know what you think about our the Daily News Journal in Murfreesboro Tennessee.